Modern web browsers can save usernames and passwords for online logins. Most of them also support "auto-fill" for data like contacts or credit cards. 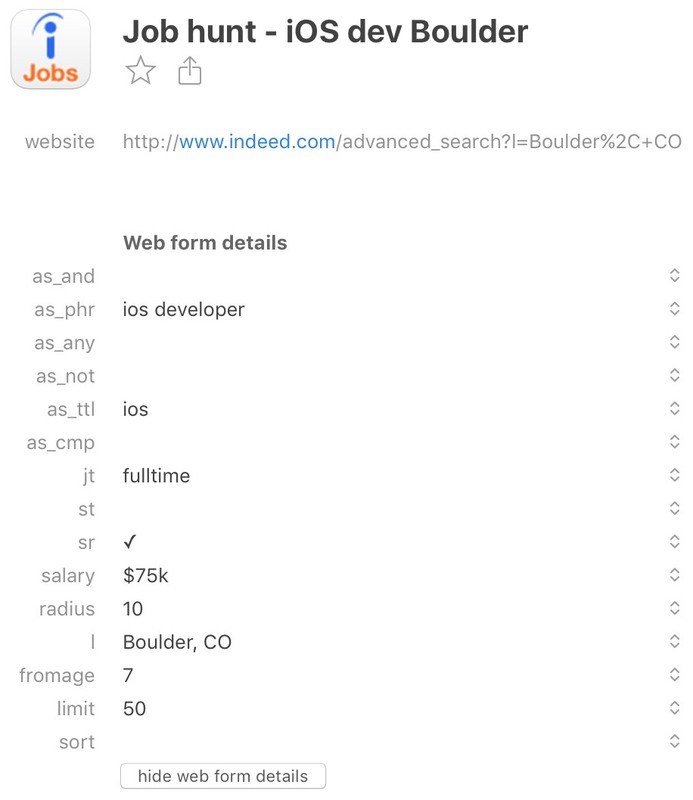 But what do you do if you regularly have to fill out complex online forms that contain arbitrary text fields, menus, and checkboxes? Try using your password manager! I use 1Password, but this tip should work with other password managers as well. 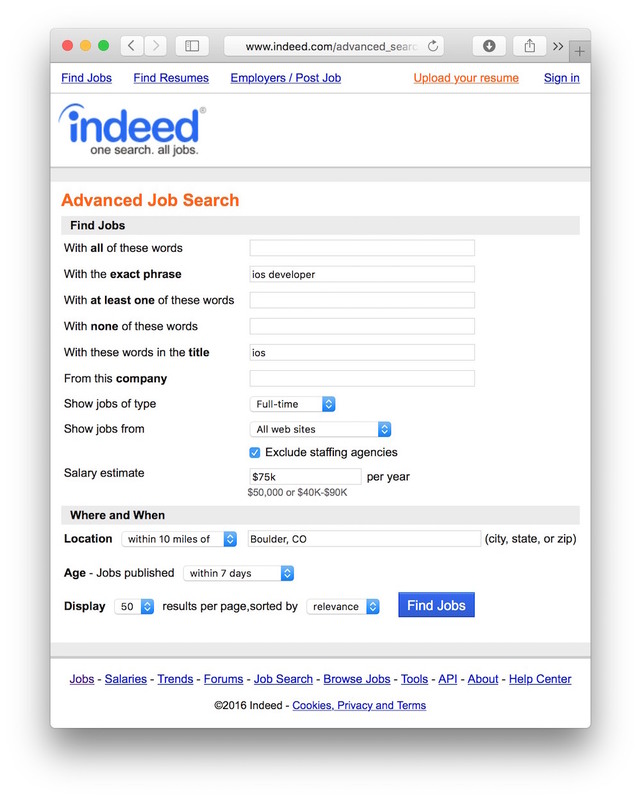 Let's say you're looking for a job on indeed.com, and have filled out the site's advanced search from. Have a Web form you need to fill in over and over? 1Password can help. 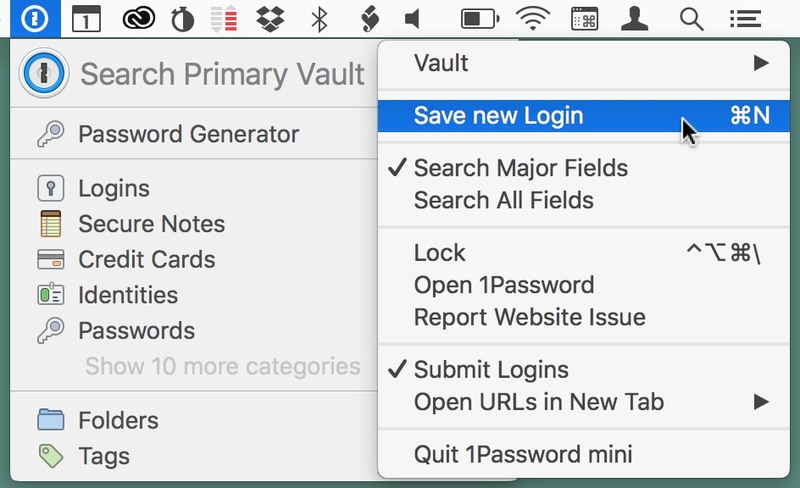 To save the entire search, summon 1Password via the keyboard shortcut (the default is Command-\), or click its icon in the menu bar. If 1Password is locked, enter your master password. Then click the sprocket wheel next to the search field, and choose Save new Login from the menu. Note that you have to perform this step before you submit the search form. That's because 1Password will only offer to automatically save the form's data for you, if it detects either a username or password field. If you want to review the stored data, open the main application, and click the "show web form details" button in the respective item. As you can see above, the stored item lists all the text and non-default settings from the form, and it also includes the link to the form's webpage. So the next time you run a complex search or fill out a web form, try saving it in your password manager. That way, if you need to fill out the same form again, you don't have to re-enter all the data. Instead, you just tell your password manager to "open and fill" the desired "login," and it will take care of the rest for you.